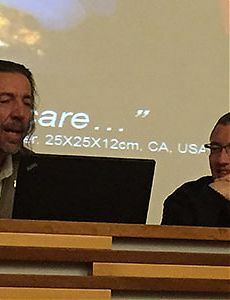 A conversation between Lanfranco Aceti and Ioannis Michaloudis who presented their current work and understanding of the cloud and the molecular in an atomized cultural and scientific context. This is particularly important in a moment in which atomized and fractured societies, like nanoparticles, aggregate and disaggregate according to internal and external stimuli, in increasingly ruthless movements which shift and change like clouds in the winds, according to multiple and disaggregated criteria. The conversation compared Michaloudis’ work and the use of nanomaterial, silica aerogel with current trends on the concepts of the cloud and molecules as alternative forms purveyors of new knowledge and understanding of our role within the re-design of concepts of society, democracy and citizenship into post-society, post-democracy and post-citizenship. The event aimed to improve public perception of scientific research in the arts, and to facilitate informed decision making bridging synergies between Art, Science, Society and Politics in the new economies of the 21st Century. The event coincided with the release of new volume by the Leonardo Electronic Almanac, titled Cloud and Molecular Aesthetics. NeMe, Leonardo Electronic Almanac, Cyprus University of Technology.